Incumbent U.S. Sen. Mary Landrieu is running for reelection this fall, and so far the race looks like a toss up. 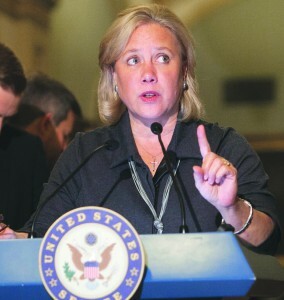 A mid-February poll by Democratic pollsters Public Policy Pollsters (PPP) showed Landrieu having only a narrow lead over much lesser known Republican opponents. PPP showed Landrieu ahead of Congressman Bill Cassidy 45-44. She was leading Col. Rob Maness 47-42 and State Sen. Paul Hollis 48-42. All of the polls taken indicated the likelihood of a runoff. That almost always spells trouble for an incumbent. Meanwhile, in an interview with the New York Times, Sen. Lan-drieu’s father, former New Orleans Mayor Moon Landrieu made an amazing admission — that he advised his daughter either not to seek reelection or at the least to prepare for defeat. Moon Landrieu said, “I have at times said, ‘Mary, come on home, girl. There’s another life out here,’ ” he said.